In the early days of Expedia.com, our business strategy was based on the agency model; taking a small commission on every hotel booking. Problem was, it usually cost more to process a booking than the commission brought in, so what we lost in margin we made up for in volume. Then a brilliant colleague proposed we pivot to a merchant model, in which Expedia would pre-purchase rooms at a big discount and then resale them at a reasonable markup. Now, of course, Expedia.com is a very profitable not-so-little business. But all this was based on the concept of hotel rooms as commodities; interchangeable wares that could be bought and sold in bulk. That certainly worked as a business proposition, but on a personal basis, I could never buy in. To me, a hotel room was not transposable, but rather transformational, a chance to take flight into new zones and experiences. A room was not about thread-count and connectivity, but personality and vibe, a basecamp for excursions and expeditions; a home renovated to something aspirational, dream-like, filled with the furniture of hope and possibility. My post-Expedia career has been The Road, laying my head on different pillows almost every night. So, naturally, I think it fair to share some of my discoveries over the past months, and those I think worth exploring during the bloom on Spring, perhaps the best time to travel and escape to another bliss. Of course, this list is hardly comprehensive, and it is highly personal, but it is a catalogue of those I found special and extreme in coziness, service and that intangible affair of the heart called romance. Who would have guessed a solar-powered luxury glamp, in the high-end-safari style pioneered and perfected in East Africa, would exist in the deserts of Saudi Arabia, but it does, and it astounds. 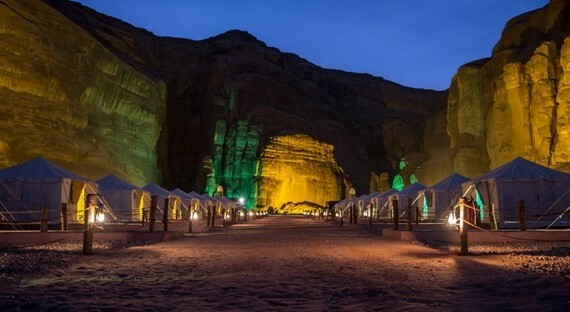 Enveloped by the high-sandstone cliffs of Al-Hajar, the tents are decorated with simple Arabic motifs; soft, indulgent beds; electric lights and outlets; and a jeweled chest with a prayer rug inside, in case you left yours at home. Camels roam around outside, and the canyons walls turn gold in the late afternoon light. There are two long common-area tents flooded with deeply napped carpets, one where cups of tea and bowls of sweet dates are served, and the other where breakfast and dinner are taken, the latter, in my visit, including a mandi, in which chicken, lamb and vegetables are baked in a sand-covered oven for eight hours before serving on the long, low table. When walking back to my tent after the savory repast, I look up and realize this is a million-star retreat. But it's the location that makes this stay extraordinary. It is just a few minutes from the UNESCO Cultural Heritage Site at Madain Saleh, spectacular tombs reminiscent of Petra in Jordan, which makes sense as they were connected to the same Nabataean empire. Imagine Petra without the tourist hordes, but instead a surfeit of buttes, mesas, spires, slot canyons and phantasmagoric formations that make Monument Valley look like facial pimples, and you have a picture of what this place offers. This may be a transcendental experience, but it is not so easy to book, as tourist visas are not available to Saudi Arabia. For information on how to make a journey that includes this wonderful encampment, contact tanya@mtsobek.com. This is more like visiting a rich uncle's country home than a hotel...everyone seems like family (in a good way), and my family and I are met, before check-in, with a scavenger hunt that gets us exploring the water features, mazy paths, the chef's herb garden, outdoor sculptures and the two pigs in the back. After the hunt, we mull our score (found all but one: a plaque on the mantel that announces: "Unattended Children Will Be Given an Espresso and a Puppy") outside the Fireside Lounge. 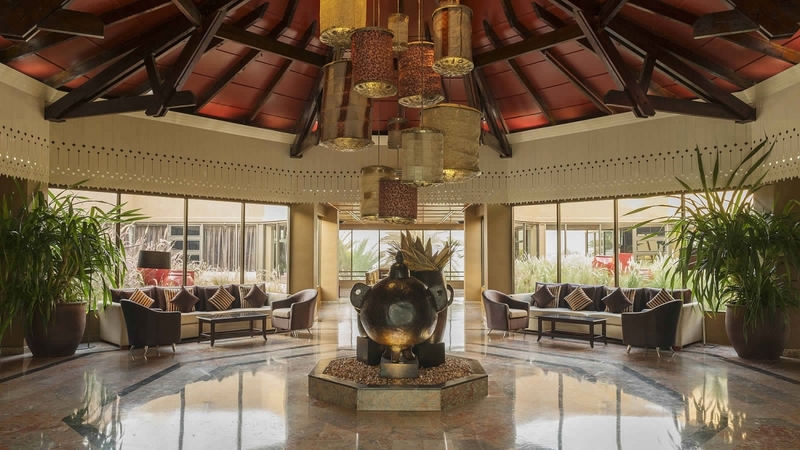 The lobby architecture is lofty Northwest, with exposed beams, rough timbers and natural stone, appointed with cushy chairs from which to sip the complimentary glass of check-in wine (I confess to indulging in the bacon popcorn offered at the bar). My understated but large room has a gas fireplace, a big Jacuzzi tub, plush white bathrobes, and a personal patio where you can sip some of the wine found in the 20 plus wineries within walking distance, or a craft from the vast Redhook Brewery steps away. The hotel offers free bikes, and there are another 80 or so wineries and breweries reachable on two wheels. Across the breezeway is the Barking Frog, one of the best restaurants in Washington State, and next to it, The Herb Farm, often cited as such (and it usually needs to be booked weeks in advance). Returning after a sublime meal, there are chocolate frogs on our pillows. And with the sunrise, a heavenly view of Mount Rainer in the middle distance. Steven Weingarten runs this flight of green in the Cordillera Central, a former coffee farm sprawling across 107 acres of unruly rainforest. Steven is a former New York attorney who fell in love with the mountains of Puerto Rico while visiting in the mid-90s, and now runs one of the best eco-lodges in the world, while teaching yoga in his on-property studio daily. "There's a certain feeling about the mountains that's spiritual in nature. With the elevation here you're closer to whatever higher power you might think about or consider when you're talking about spirit," reflects Steven standing above his realized sanctuary. "Institution is the shadow and length of the man. So, this place is my work of art." I can't disagree. I spend four nights here with my family and our friends, the Johncks, and find every moment a delight, from reading in the porch hammocks, to hiking the rainforest, swimming the nearby river, munching on local farm-to-table vegetables, and generally soaking in the scenery. The rooms have no television, no radio, no internet, so you have to unplug and be present. The entertainment is outside: butterflies and flamboyant birds paint the sky, and mist spins the tall trees like a wheel turning wool. Sunbeams fracture across the wide palm leaves. In the distance the mountains undulate as though forming the backbone of a giant beast that has laid down to sleep and might at any point awake and stand up several miles high, shaking off the vines and trees like pieces of fluff caught on its felt green jacket. Great stories unfold from the wooden porch.... Whatever you do, don't change the channel. I used to travel to Boston regularly, but haven't in a few years, so it was a treat to make the trip to visit old friends Judi Wineland, a true pioneer in the adventure travel realm, and the inexhaustible talent that is the writer David Roberts, who traveled with me on expeditions in Ethiopia and Papua New Guinea. Judi and I caught up over wine, and on an urban hike, but I didn't get to see David, who was recovering from an illness, so I found myself spending more time in the hotel than typical. But in this case, it was a serendipitous turn, as the hotel is so special. 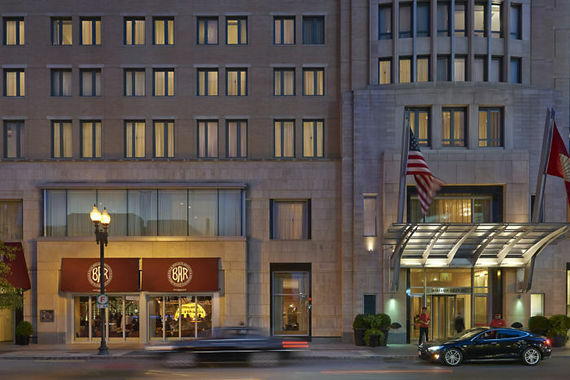 I chose the hotel initially for its location.... smack in the center of Boston, by Copley Place, and walkable to many of the great restaurants and attractions (and connected to the Prudential Center mall, so if the weather is foul, you don't even have to go outside), but the capacious and quiet room itself is a destination. The hardwood floors give it an Explorers Club feeling, and the couch overlooking Boylston Street provides a view to endless entertainment. The chocolate-dipped strawberries are not bad. The bathroom is like a spa, with a rain shower and luxuriating tub, and thick, thick towels, even slippers. After a cup of coffee from the in-room Illy espresso machine, breakfast in the Bar Boulud is scrumptious. Holding both the AAA Five Diamond and the Forbes Five-Star awards, I would multiply each by ten. Right on the glimmery waters of the Gulf of Aden, this is a spectacular and comfy hotel in a peaceful oasis of a country surrounded by conflict, Somalia to the South, Eritrea to the North, and Yemen just across the waters. There are several major foreign military bases here, including a U.S. drone center, and as such the U.S. Ambassador tells me over dinner that Djibouti "is the safest city in Africa." This former French territory is certainly a crossroads of intrigue, and I half expect Hercule Poirot to come ambling down the hallway. After a freshly-squeezed juice in the lobby, I take a swim in the naturally warm pool, which is surrounded by razor wire, a first for me. So is the hookah bar, and the streaks of green parrots passing by the windows. But the real reason this makes The List is that it is a gateway to some of least-known but grandest adventures in the continent. This is the place to dive or snorkel with whale sharks. It is one of the few places you can kayak by a secret base and watch military drones take off on their missions. And, from here you can visit Lake Abbe, the lowest point in Africa, with a landscape so phantasmagoric it was featured in Planet of the Apes. After a few days exploring the stunning countryside, I return to the Sheraton as an Afar wedding is unfolding in the Ghoubet bar, and am invited in to rave and rejoice with the reception party in their shimmering costumes as they step and whirl a traditional type of dance, called jenile, colorful as a Djiboutian coral reef. Where else in the world does a hotel offer such cast and chroma, along with ice cold Tusker beer? This is an unpretentious hideaway on a quiet residential street on the north side of town, so discreet rumors persist that JFK snuck to a private entrance to a corner suite for trysts with Marilyn. 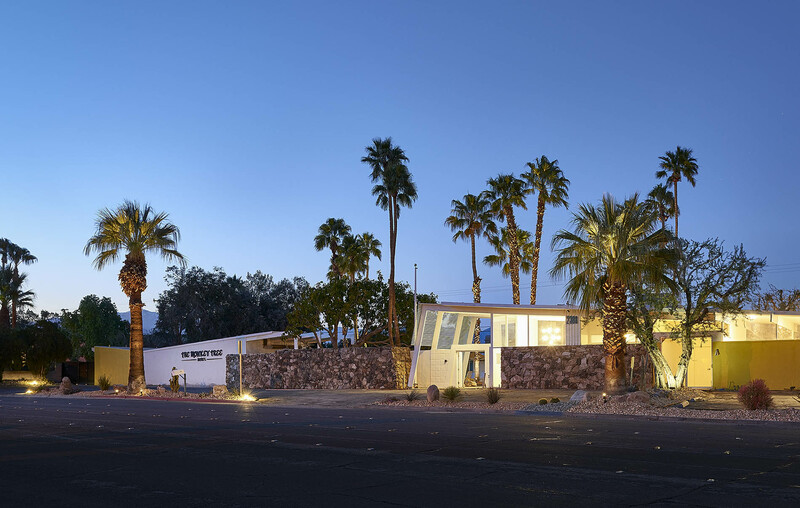 It was designed in 1960 by Albert Frey, and guests reportedly included Lucille Ball, Desi Arnaz, Eric Clapton, John Lennon, Bob Hope, Spencer Tracy and Katherine Hepburn, all seeking private refuge under the sharp blue Palm Springs skies. This place has desert style to spare, and plays up the tribute to the Rat Pack era with the mid-century modern architecture, hyper-white walls, sun-yellow umbrellas and candy-colored furnishings. While lapping the heated saltwater pool I stop to soak in the sounds from the overhead speakers: The Zombies, the Kinks, Shadows of Night, and others who made Frank Sinatra seem old in the swinging 60s. The new owners, Gary and Kathleen Friedle (refugees from Brooklyn), have refitted the place to include the only Scandinavian spa in the area (with sauna, whirlpool and cold plunge). The sangria laid out with snacks in the late afternoon is a nice touch, and the jungle wall-paper in my wicker-cased room the size of Brazil sets a mood, ring-a-ding-ding. My elder son lives in the Seattle area, so I head to the city often. And the Mayflower Park has become a favorite, for its century-old charm and location (right near the Monorail, Pike Place Market and the Nordstrom's flagship store, which my wife never misses). In contrast to the sleek tech-architecture gleaming throughout the region, this place feels anchored in a more genteel era, and the staff bend over backwards to evoke that politeness and accommodation. It is the longest continuously operating hotel in Seattle. 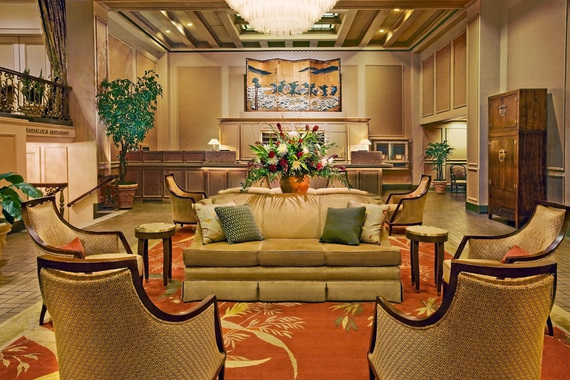 The lobby lights with crystal chandeliers, gleaming brass, and period antiques offering vintage grace to the visitor. My room is spacious, not stuffy, with luxurious bedding for a century of sleep, a delicious view of the harbor, and a bathroom appointed for comfort. I can tell the whole space has been thoughtfully renovated as there are wall-plugs everywhere. Both restaurants off the lobby, Andaluca (mahogany mill work, hand painted murals and plush, deep-toned fabrics working together to conjure up a Mediterranean grotto) and Oliver's (infamous for its martinis, and giant windows to the street), are soft-colored and charming. The American breakfast is lovely. There is no unpleasantness. The whole Mayflower experience suggests European elegance and fine-taste. Sometimes you want to lose the t-shirt and khakis and dress up a little, and this is the place. I can't go a season without some ski-time, and this year discovered the family-run Alpenhof, which not only has Bavarian charisma to spare, but is steps to Mammoth Village and the all-important Village Gondola, and what could be better than that? Well, maybe the hot chocolate, hot cider and cookies available in the lobby at all hours, the free parking, and the hot tub in the basement. The whole vibe is homey...even the keys are analogue, like the olde days. My large room is toasty, which is the key thing sought after a day downhill. And there are two bottles of complimentary water, much needed at this elevation. 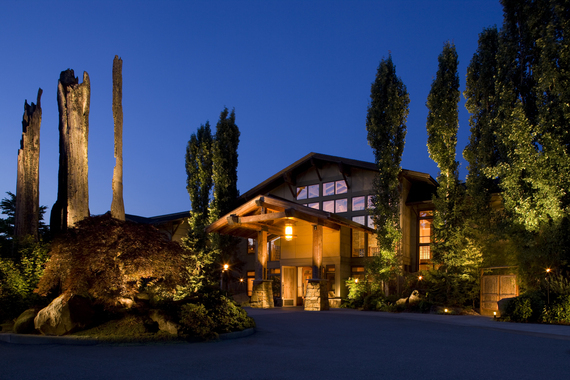 And the Clocktower Cellar, with over 150 whiskeys, is perfect for an après ski setting. Before heading to the slopes there is a gratis buffet breakfast, piles of meats, cheeses, hard boiled eggs, hot oatmeal with fixings, fresh baked muffins, pastries, bread and English muffins, orange juice, apples, bananas, oranges, yogurt and a selection of cereals. 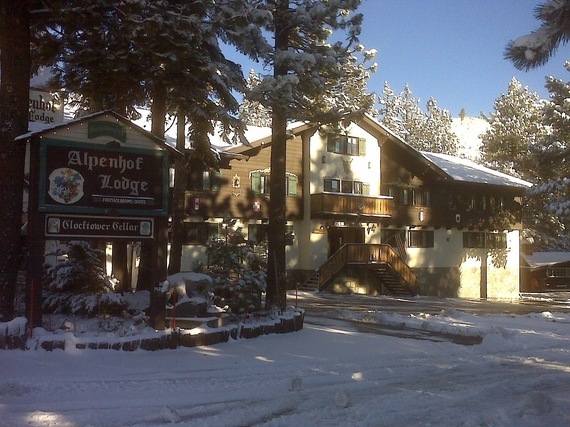 It all means you can fill your belly (and pockets), skip lunch and spend more time in the snow. My eight-year-old, Jasper, loves Woolly's Tube Park just down the road, and my wife takes off for some cross-country. The Alpenhof is a hub that spokes to everything, and the secret is out, as it is hard to book during prime-time. But worth it, if you can get in. I was in Yangon during Aung San Suu Kyi's election last November (don't ask why, or how we did it), and afterwards headed to Bagan, home to the largest and densest concentration of Buddhist temples, pagodas, stupas and ruins in the world, where I checked into the Bagan Thande Hotel. 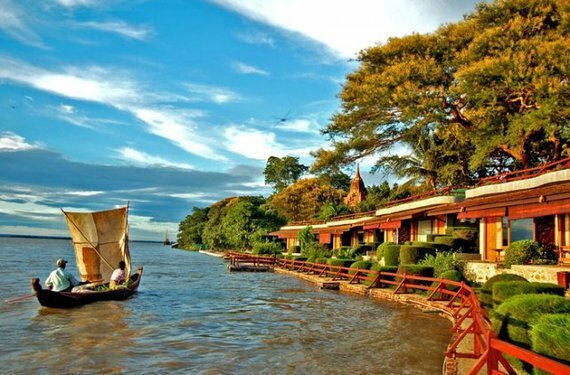 This was the first hotel in Bagan, opened in 1922 for a visit from The Prince of Wales, but even then they had a sense of what makes an epic location: right on the luxuriant banks of the broad, unhurried Irrawaddy River. My room is an old colonial style bungalow with polished wood panels and flooring, and a private terrace overlooking an atmospheric garden. My royal bed is adorned with a heart-shaped arrangement of tiny, fragrant flowers. This may be the best place in Asia to watch the sunset (and sip a G&T while solving world problems). The curry-themed dinner is on a manicured lawn, under the canopy of an enormous rain tree, scampering with squirrels and secreting several owls. The feast is enchanted with a traditional puppet show, enacting local legends, set to classical Burmese music. My wake-up call is birdsong outside my door. At breakfast, in the leafy shade, you can watch the passing boats and hot air balloons riding over pagodas across the river. From here my friends and I rent e-bikes, and scoot around to the archeological zone and the various temples, all crowded and busy, but then back to the sanctuary of the hotel, and all it does to spoil its guests.